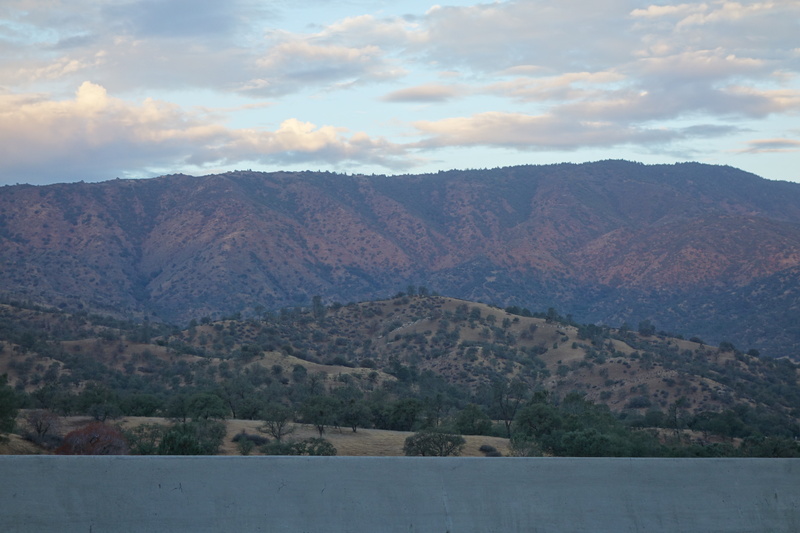 The thought that I could be home by noon woke me up at 5:00 am in Tehachapi, California. After three restful days with relatives in Flagstaff, I hit the road on Saturday morning. Six o’clock on this Sunday morning, I stopped in at Starbucks. It was open. Opening time during the rest of the week is 4 am. I’m in trucker territory — although, come to think of it, I always pulled out of the trucker motels where I stayed earlier than any truck. The drive from there to Tehachapi took longer than I thought. I’ve never driven across high plains and seen three distinct, simultaneous weather systems. Dark slate clouds and lightning to the left, sheets of rain in the distance to the right, blue skies ahead of me. By 10 am, I realized that the closer I got to home, the more tired I felt, even though I haven’t felt tired at any point during the trip. One stop at my local grocery for supplies and then home. It took me half an hour to unload the car. It’ll take me several days to put everything back in order. I flopped on the couch and fell into a deep sleep for an hour. I’m home. As I’ve already said to a couple of friends, I feel extraordinary lucky — maybe even cheated — that the worst I can say about any part of my trip is “been there, done that.” I’ve seen so many sites that I’ve always wanted to see and talked to so many strangers, visited much loved friends and family, that I’m afraid of the let-down in the days ahead. Furthermore, I have also been highly conscious of how peculiarly American my trip has been. Perhaps it’s only the America of baby-boomers, to whom Route 66 means something and the price of gas is not intimidating. Every country has variegated cultures within its borders. Other countries, like Russia and China, have ethnic complexities of their own equal to ours. Unlike them (as far as I know), we have a romance with car travel. The vastness of this country means that it requires effort to sample a swathe of them. Our sense of distance is as relative as Einstein’s time/space continuum. Five hundred miles? No big deal. Oddly enough, now that I’m home, the strongest urge I have at the moment is to get another dog. In other words, this trip helped me work through a restlessness that emerged after my last dog died two years ago. Now I’m ready to put down roots again. Thanks to all of you who have read these posts. I’m ready for bed. Glad you’re home, safe and sound! Welcome home! It’s been quite a journey, uniquely American and uniquely Sally. Wonderful to be home safe and sound. I think it was a really interesting trip. I’ve loved the thoughts and observations you’ve shared. The strangest one was today when you revealed your urge to get a dog. I like that idea.